If you think Ron Paul's comments hold no water, think again. As the Free Thought Project reported last year, even the former chairmen of the Federal Reserve is predicting this crisis. We are in very early days of a crisis which has got a way to go," asserted Alan Greenspan to Bloomberg last year. "This is the worst period, I recall since I've been in public service. There's nothing like it, including the crisis — remember October 19th, 1987, when the Dow went down by a record amount 23 percent? That I thought was the bottom of all potential problems. This has a corrosive effect that will not go away. I'd love to find something positive to say.....I don't know how it's going to resolve, but there's going to be a crisis." 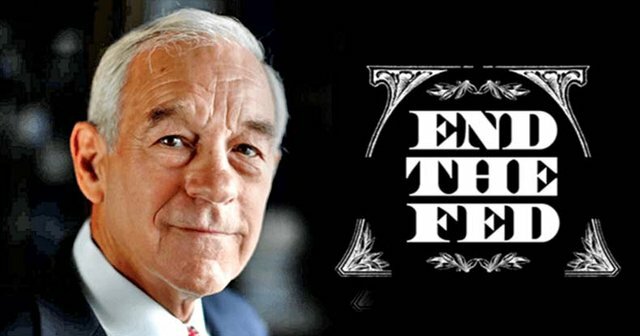 When the man who used to run the very central bank Ron Paul says is responsible for the collapse, also says there's going to be a collapse — it's time to pay attention. I honestly never thought he would win, but some people told me he would because it's easier to blame a white rich man. I thought they had him running so that people would vote for whoever would oppose him, but maybe he's just there as a scapegoat. I have been watching Ron Paul's video in youtube about the impending US economy and stock market collapse. One of the strategies to face this collapse is to invest in physical gold and silver. Here in Singapore, there's no tax for the purchase of investment-grade precious metals. Any idea if crytos will be pegged to gold in the future? Ron Paul is right, but Trump is currently dealing with internal issues and domestic threat more than external threats.